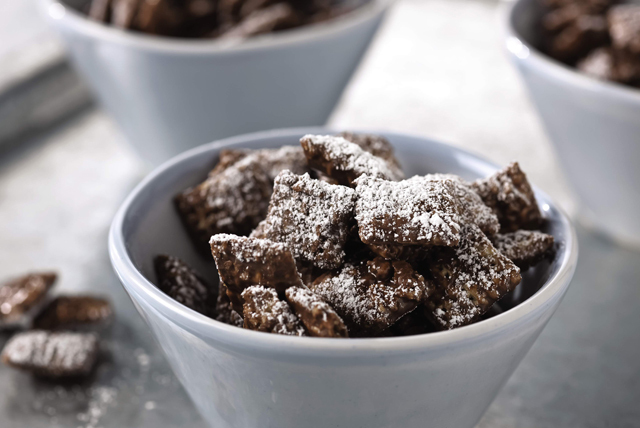 This Puppy Chow may look like kibble, but it's surely not for the dogs! It's for everyone who likes chocolate, peanut butter—and easy puppy chow recipes. Microwave peanut butter and chocolate in large microwaveable bowl on HIGH 1-1/2 min. ; stir until chocolate is completely melted and mixture is well blended. Add cereal; toss to evenly coat. Spread into single layer on waxed paper-covered baking sheets; separate cereal pieces. Cool completely. Transfer cereal mixture to clean brown paper bag or large resealable plastic bag. Add sugar; close bag. Shake gently to evenly coat cereal mixture with sugar. Prepare using oven-toasted corn cereal squares. To present as holiday gifts, pack in holiday tins. Or portion into plastic food storage gift bags, then add a strip of colorful paper and bow at top of each bag before stapling to close.